Have Persimmon Tried To Buy A Better HBF Star Rating? Home » Have Persimmon Tried To Buy A Better HBF Star Rating? 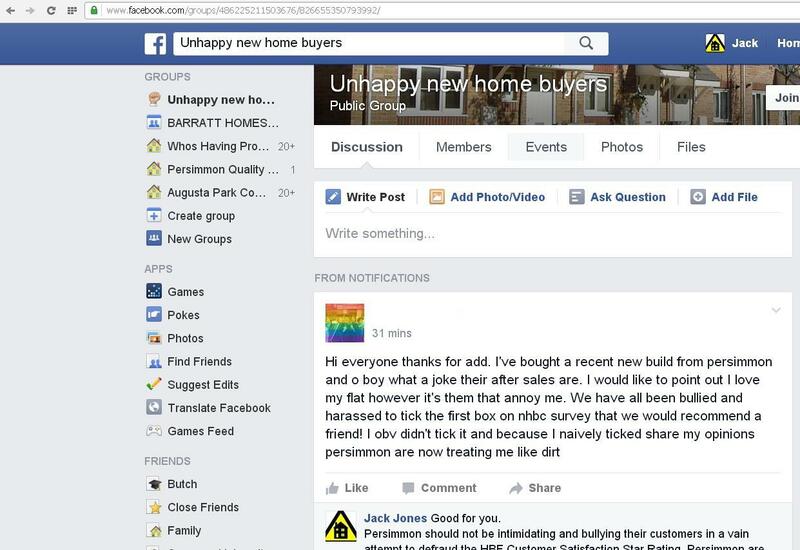 Posted on 18/04/2016 by New Home Expert | Comments Off on Have Persimmon Tried To Buy A Better HBF Star Rating? Can buyers trust HBF builder Star Ratings? 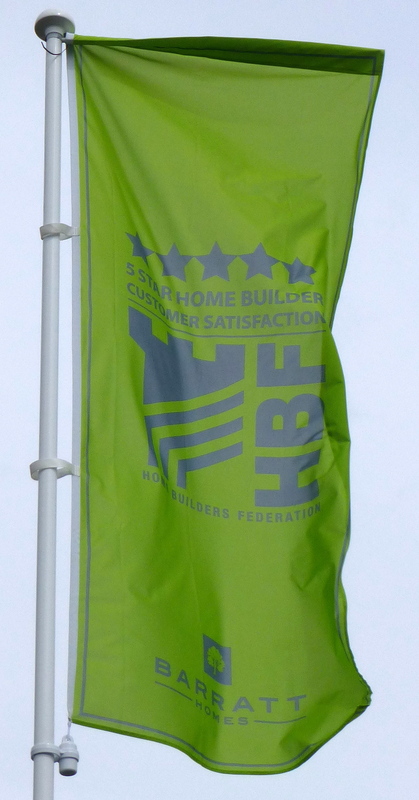 The HBF National new home customer satisfaction survey is now in its eleventh year. The house builder star ratings (awarded by the HBF) “are allocated according to the proportion responding Yes..” to Question 1 of the survey: “Would you recommend your builder to a friend?…. Yes or No” The more that respond “Yes”, the better the builder’s star rating. I think this was by far, the most shocking response I received. I even queried the amount of the voucher! After further discussions with this Persimmon buyer, it was confirmed that the voucher was indeed for £250 and not £25. A series of e mails I have seen, between GL and Persimmon Customer Services, would appear to confirm that vouchers were given and indicate this buyer needed to chase Persimmon for his £250 John Lewis Vouchers – two months after completing the survey last September! 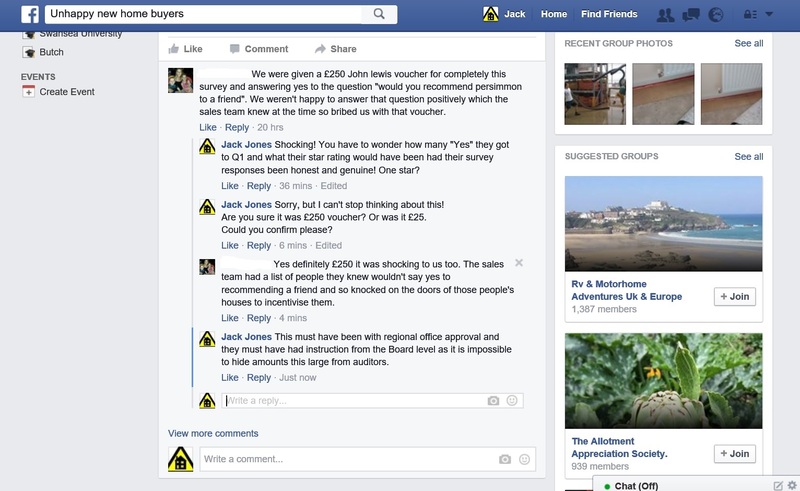 Apparently the vouchers were ordered by Persimmon’s sales department and were then being passed to the site sales offices. So why would Persimmon do this? Last year Persimmon were rated 3 stars by their customers. In the latest results, they are again rated just 3 stars. Hardly something to advertise considering Bovis are the only other large house builder to match their low 3 star rating! But might it have been worse? For example, out of a total 6,034 survey responses, it would only need as few as 240 buyers who intended to respond “No” to be persuaded to respond “Yes” to provide a 4% swing. This might be sufficient to change a builder’s star rating from a possible 2 star (less than 69.9% “Yes”) to 3 star (above 70% “Yes”). In addition, as the “Industry Results are weighted”, this could also have a marked effect on the industry’s overall “satisfaction – recommend a friend” score percentage, as the six largest house builders accounted for over 53% of the total surveys returned in the 2016 results. It is unfortunate but fairly common, for house builders to offer cash incentives to encourage their homebuyers to use the builder’s favoured firm of Solicitors, more often than not to the buyer’s detriment. But cash, in the form of store vouchers, in return for positive customer survey responses is, in my opinion, a new low even for this industry. It is not known if the “substantial resources” referred to includes incentives given to buyers in the form of £250 John Lewis vouchers. I think it is ironic that Persimmon would choose to give John Lewis vouchers (a company with unquestionably the best customer service reputation in Britain) in an attempt to improve their own customer satisfaction rating. All house builders would do well to replicate John Lewis’ customer service policy and ethos! I contacted Persimmon to provide an opportunity for comment to either confirm or deny whether any Persimmon Group employees have ever offered any incentive to their customers, such as store vouchers or free extra works, in return for a positive response from the buyer completing the 8-week HBF Customer Satisfaction Survey; in particular a “Yes” to Question 1 – the star rating question?. I also asked if Persimmon kept a list of buyers on developments, those most likely to give unfavourable responses in the HBF 8-week survey. I asked the HBF if they or the NHBC have any way of validating or verifying to rule out “incentivising,” especially as blatant as this? I also asked whether they are aware that some builders incentivise their customers to complete the survey with more favourable responses than they might otherwise have done and what action would be taken against any builder found to be breaking star rating/survey rules? 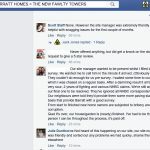 In reply Steve Turner at the HBF told me: “clearly builders can offer incentives as part of their marketing, but it is against the rules to offer incentives that relate to the survey. If you send us details we will of course follow up.” Well the HBF have the details now! In 2007, Persimmon were rated 3 star but the results indicated an ‘α’, meaning after taking into account the error margin, the true figure could lie within the lower 2 star band. In 2008, Persimmon were rated 2 stars. In 2009, Persimmon were again rated 3 star with the ‘α’ indication that the true figure could lie in the lower 2 star band. No error identifiers have been given since the 2010 results. I asked the HBF if Persimmon could have had the ‘α’ in the 2016 results, indicating a possible 2 star rating? How do house builders know when they need to “act” to get a higher Star Rating? Rule 2 of the HBF star rating scheme states: “HBF will inform Members in writing of their HBF Star Rating only when all Star Ratings to be awarded in the year in question have been decided by HBF.” Decided by the HBF? All house builders building 300 or more new homes already know, as shown above! Rule 11 states: “Members may not use or refer to the statistical data underlying their Star Rating in the public domain.” Why? What could this reveal? How closely some house builders might scrape into the next star rating? Note: a Q1 70% score for Yes is 3 star but 69.9% is 2 star. A close call! 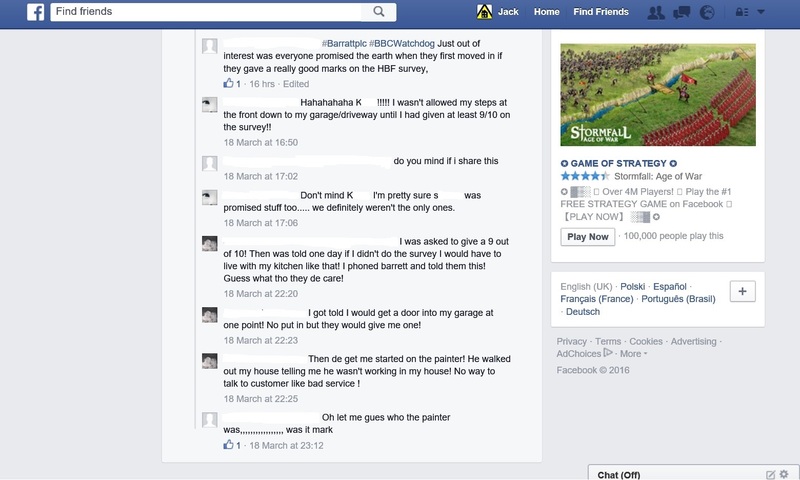 “Written in the stars” – Is this how Barratt get their five star rating? 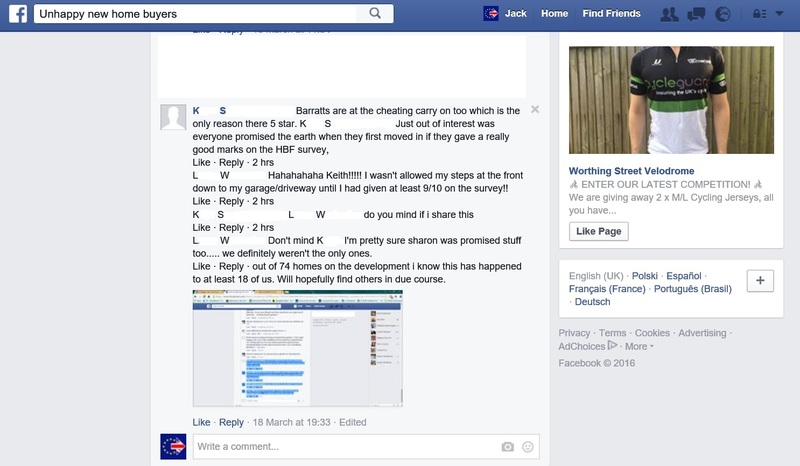 Do Barratt site employees offer their buyers inducements (free extras and alterations etc) in return for good marks in the HBF 8-week survey? 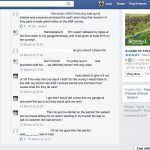 In 2013, a Barratt contracts manager told me that a proportion of their site manager’s £10,000 maximum annual (“best in the business”) bonus (unusually, paid in monthly instalments) is dependent on his buyers returning an average five-star (92% or more) survey satisfaction score each month. (Other bonus criteria included: customer care, NHBC inspections and Health & Safety.) He said most of his region’s site managers received “at least 70%” (around £583) of the maximum bonus available each month. Could this bonus be the incentive or is giving buyers free extras in return for good scores, simply a means to a desirable end? In any customer survey, financial incentives offered to staff based on survey results will always have the potential to corrupt the results, no matter how strong the corporate culture is. It is more important to gather authentic feedback about customer satisfaction from the survey. 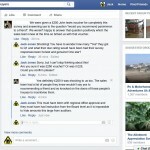 Incentives poison the well. Survey results shouldn’t be used to measure employee performance. It will be more effective to share relevant, genuine, honest feedback with employees so that they in turn can serve customers better in the future. 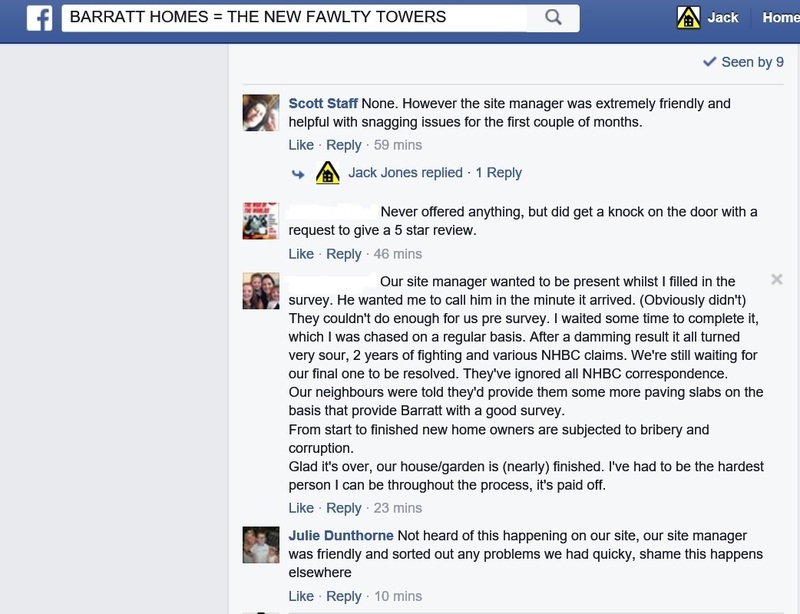 Barratt state on their website that they are now: “recognised as the highest quality national housebuilder” “We are industry-leading in terms of our quality…” A fact that could perhaps be justifiable on the basis of their site managers winning more NHBC Quality Awards than any other house builder. It could also be because they are the only house builder to have been rated ‘five stars’ in the last seven surveys. Rule 8. Members may not make any alteration (as to size, shape, colour and any other characteristics) to the Star Rating Logo nor at any time use any other logo or device which is similar to or may be confused with the Star Rating Logo. The design guidelines for use of the Star Rating logo are defined in Section 3. Rule 21. Members may encourage homeowners to respond to the Survey by informing them of its existence prior to the commencement of the invitation process which begins exactly 8 weeks after legal completion. However, once the invitation process has started Members should not discuss the survey with the respondent or pressurise them to complete it. 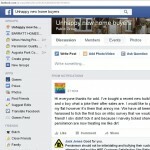 It would appear that the HBF rules are being broken and knowingly! Send the first 8-week survey randomly, at any time in the first 8-16 weeks. This will mean house builders won’t know when buyers receive it, making coercion more difficult. Make all survey responses 100% anonymous, rather than leave buyers to tick a box. This would ensure house builders are less likely to offer “incentives” as they would have to implicitly trust buyers to give positive responses. This would also make it less likely that house builders would victimise buyers for submitting unfavourable survey responses. Prevent house builders from seeing their scores until the survey is published. Having the ability to see their current star rating (and other scores) in real time, means builders are more likely to break the rules in attempts to achieve a higher rating. Only allow builder’s a star rating if the number of surveys returned equate to at least 50% of the private homes they build in the survey year. Properly enforce the star rating scheme rules, with sanctions for house builders found to be breaking them. Normally, the purpose of a consumer survey is to enable customers to give an honest response regarding the product or service. It should highlight the best, praising those doing excellent work and highlighting those areas of a business in need of improvement. A customer-satisfaction survey that dissatisfies customers and produces false information is an embarrassment to the industry and those conducting it. It is essential to have reliable, honest and true measures of customer satisfaction for new-build homes. The new home customer satisfaction survey must be made 100% independent of the house building industry and audited. At the APPG Inquiry, I called for a fully-independent “New Home Customer Satisfaction Survey” for EVERY new home built, conducted by a totally independent and autonomous government-appointed body such as the Trading Standards Institute, with all results and a house builder league table being made public by the Office of National Statistics. The APPG Inquiry report is due out mid-May! 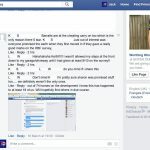 It is my opinion that the buyers’ quotations in this article, reproduced entirely as they were originally written on posts freely made publicly on Facebook, that would be considered by a reasonable person, to be true and the opinions or experiences of these private individuals. This article is my honest opinion of the buyers’ own claims that any reasonable person might also conclude. I believe this is a matter of public interest, as the house building industry so often refers to their 8-week survey results as confirmation and evidence of high levels of both customer satisfaction and quality. If HBF star rating rules have been broken, UK consumers can no longer rely on builders’ star rating as an accurate reflection of customer satisfaction for comparison purposes. I have contacted the house builders concerned and the HBF, on several occasions to obtain confirmation, denial, or any possible explanation, justification, or information and have included these response(s) such as they are. This entry was posted in Barratt/David Wilson Homes, New Homes, Persimmon and tagged barratt, builder star rating, customer care, HBF, house builders, persimmon, survey. Bookmark the permalink.